Lock in a great price for Hotel The Originals Le Bois Joli (ex Relais du Silence) – rated 8.5 by recent guests! 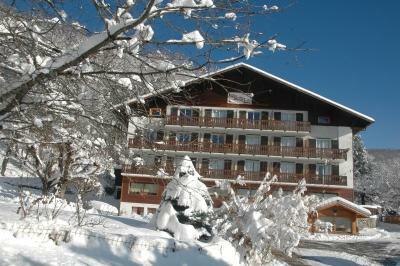 A beautiful hotel in a stunning mountain location. Lovely room and exquisite restaurant. The outside pool was perfect and the food was superb. Thee location was stunning with a gorgeous view from our room (no 11) The staff were very friendly and helpful and went out of there way to make our stay enjoyable. A lovely tittle pool outside, the gamesroom and jacuzzi were added bonus. Excellent location with lovely views, very friendly staff, great breakfast. Friendly and helpful staff. The hotel has lovely views and also the benefit of an outdoor swimming pool. Breakfast was also nice and evening meals were of a high standard. The food was nice in the evening. The decor was lovely. And the staff were great. Beautiful setting if you want to feel like you're miles from anywhere but want a quick drive to evian, it's very quiet and a great place for a night away from daily stresses! The view was stunning and the staff friendly. The spa and hammam were nice. The food was very tasty in the restaurant and the staff attentive. Hotel The Originals Le Bois Joli (ex Relais du Silence) features charming accommodations and welcomes you all year round between lakes and mountains in Evian les Bains. The charming guest rooms are comfortable with a view of the mountains. They are equipped with modern private bathrooms and WiFi internet access. In addition to all of the year round mountain activities available in the immediate vicinity of the hotel, Hotel The Originals Le Bois Joli (ex Relais du Silence) also features a steam bath, hot tub, sauna, fitness and massage rooms and a swimming pool. Sit down in the hotel's restaurant and enjoy traditional mountain and regional cuisine. In the warmer months you can dine on the terrace. Whether you plan your stay for winter or summer you will never be unspoiled by the marvelous beauty of the area surrounding the hotel. When would you like to stay at Hotel The Originals Le Bois Joli (ex Relais du Silence)? The rooms feature satellite TV and a balcony with a view on the mountains. House Rules Hotel The Originals Le Bois Joli (ex Relais du Silence) takes special requests – add in the next step! Hotel The Originals Le Bois Joli (ex Relais du Silence) accepts these cards and reserves the right to temporarily hold an amount prior to arrival. We felt the breakfast had a very limited sullection for the price and the coffee tasted horrible. Also there is no coffee/tea making facilities in the rooms. The room was a little bit small. The toilet should have a sink inside. The breakfast was disappointing. There isn't any control on how many people can enter the spa so it got a bit weird when 3 strangers entered the spa whilst my wife and I were in there. It only really has capacity for 2 or 3 people. The sauna also needs some attention as it has far too many gaps in the door and roof to get properly hot. Although delicious the meal was quite pricey for what it was but this is usual in France I find. The last thing I would change is to improve the quality of the mattress as it had a very basic feel, but I slept very well regardless. All staff speak only french. A little bit English and because of it we had miss understanding. The mattress was too firm for us! Staff welcoming, approachable & helpful. Lovely swimming pool. Room & ensuite very clean; only downside was the very firm mattress.